Nintendo has issued the latest details and story trailer for Sushi Striker: The Way of Sushido, its newest game for Switch and 3DS. We have everything rounded up below. 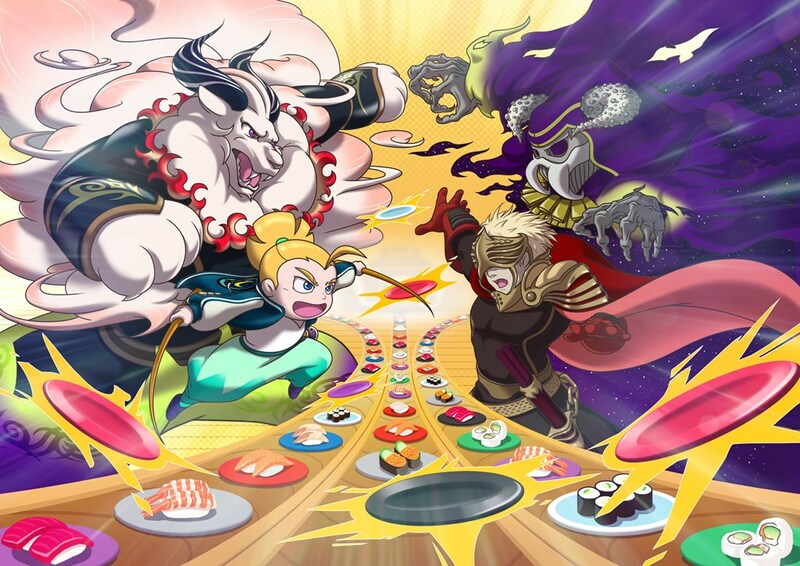 Sushi Striker: The Way of Sushido combines bright, anime art style with frenetic yet tactical gameplay centered on consuming as much sushi as possible – delivering a veritable conveyor belt loaded with surprise and delight. Imagine a world in which the sinister Empire controls the consumption of sushi with an iron grip and denies any mention of it to all inhabitants of the vanquished Republic. Players assume the role of orphaned hero Musashi (playable as either a male or a female avatar), embarking on a grand adventure to restore sushi to the world. Meet a colorful cast of characters along the way, including treacherous local bully Kojiro, musclebound Imperial enforcer General Kodiak and beautiful sushi assassin Celia. Battles are contested between two opponents, each with access to three of their own conveyor belts of sushi, plus a seventh shared belt in the middle. By linking (aka eating) sushi plates of the same color, players create stacks that can then be hurled at their opponent. The frenetic sushi-eating action is coupled with significant tactical depth. Players will encounter divine beings, called Sushi Sprites, which provide special skills that can be chained together in battle for a variety of powerful combos. There are more than 50 Sushi Sprites to befriend, many of which can evolve into more powerful forms. In addition to the rich and wacky single-player adventure, two players can challenge each other to local multiplayer battles on a single Nintendo Switch system. With the Nintendo 3DS version of the game, players can battle locally with their own systems and games. So, grab your chopsticks and prepare for battle when Sushi Striker: The Way of Sushido launches on June 8.